Pope Francis has offered a special prayer for peace between the Palestinians and Israelis. Giving the traditional Angelus prayer in St Peter's Square at the Vatican, the head of the Roman Catholic Church renewed his call for prayer and assistance for those hit by the conflict. "The United Nations stands ready to assist in the implementation of an agreement that would consolidate peace and allow for much needed reconstruction and development of Gaza." "In the case of Israeli procrastination or continued aggression, Hamas is ready with other Palestinian factions to resist on the ground and politically." "If there is a full ceasefire on the ground the Israeli delegation will arrive in Egypt tomorrow." "There is a ceasefire in place now, but that doesn't meant that people's lives have improved. People have no access to water and electricity and the health service is collapsing. Until we have a long term political solution the situation will continue to be catastrophic." 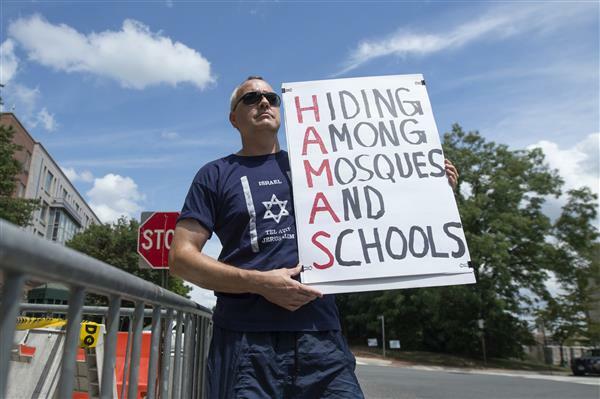 A supporter of Israel holds a sign that reads 'Hiding Among Mosques and Schools', outside the Israeli embassy in Washington DC yesterday. "The gaps between the sides are big and there is no progress in the negotiations." Israeli official - speaking to Reuters news agency. An Al Jazeera contact says Hamas has called for a rally in Khanyounis, south Gaza Strip, in solidarity and support for the Palestinian negotiation delegations currently in Cairo for the ceasefire talks. 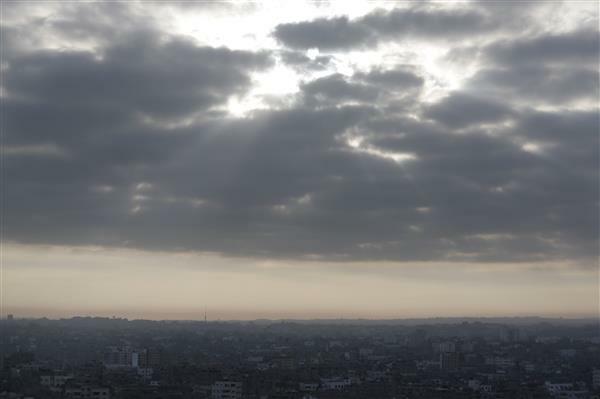 Reports are coming in that an Israeli drone has fired a rocket into Gaza sea. In the south of the Gaza Strip, Israeli gunship navy opened fire at the sea shore of Rafah. 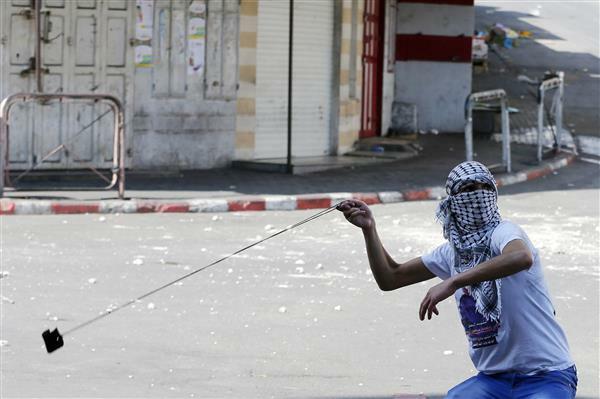 UPDATE [10GMT] : The Israeli army has told Al Jazeera they are looking into the incident. More soon. A group of human rights organizations say they are organising a flotilla of boats that will attempt to breach Israel's blockade of Gaza. The Freedom Flotilla Coalition said on Tuesday it planned to sail to Gaza "during 2014" but did not specify how many vessels would participate, but said the flotilla was "a reflection of the growing worldwide solidarity with the Palestinian people." The Palestinian ambassador to the United Nations has invited New York Governor Andrew Cuomo and top state legislators who are heading to Israel this week to visit the Palestinian territories and experience "all sides of the conflict, not just one." Ambassador Riyad Mansour said in a letter to Cuomo on Tuesday obtained by the AP news agency that the delegation's visit to express "solidarity" only with Israel will encourage the Israelis' belief that their "military aggression" in Gaza and illegal denial of basic freedoms to the Palestinians are justified. 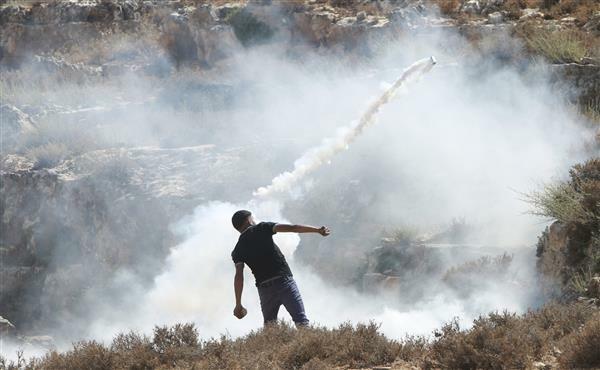 The responsible action would be to visit the Palestinian people and their leadership too and to see first-hand the wider context of this conflict, and the heavy toll it is taking on innocent Palestinian civilians across the occupied Palestinian territory. Israel is now preparing to build a network of sensors to try to detect tunnel building into its territory from the Gaza Strip, but it could take months to prove the technology works, a senior army officer told Reuters news agency. A Palestinian woman holds a wounded boy at a United Nations-run school sheltering displaced Palestinians from the Israeli offensive, in Beit Lahiya town in the northern Gaza Strip. The president of the UN top human rights body says the commission on possible violations of the rules of war in Gaza is "operational" despite the decision by British-Lebanese lawyer Amal Alamuddin to pull out of the panel a few hours after she was appointed. 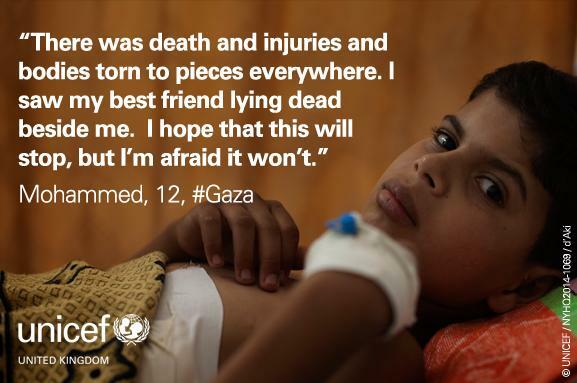 #Gaza: 14 of our 21 health centers are operating. 91% of staff are reporting to work as the ceasefire holds. 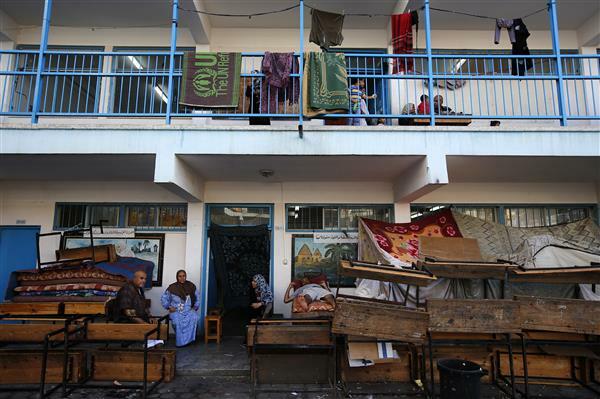 A UN school in Jabalia, northern Gaza Strip, is now home to thousands of Palestinians who fled their homes in fear of Israeli airstrikes. Amid the devastation, children continue to play. 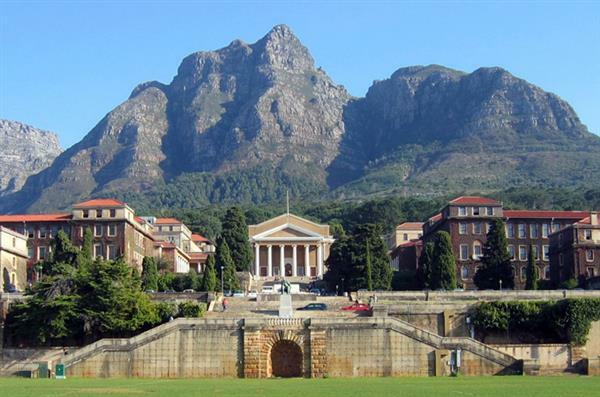 The University of Cape Town's (UCT) Student Representative Council has backed a call to boycott Israeli produce, and "unconditionally" declared Israel an Apartheid state. The memorandum tabled by the UCT Palestine Solidarity Forum, also calls for the expulsion of the Israeli ambassador to South Africa and a boycott of the security contractor, G4S, which is currently contracted by the university, over its ties to Israel. Similar resolutions have also been in other universities in South Africa, including Witwatersrand, and the University of Johannesburg. The British entertainer, Russell Brand, who rose to attention recently with his criticism of media coverage of the conflict in Gaza talks about the issue of companies that invest in Israel, and whether they share responsibility for the ongoing war. 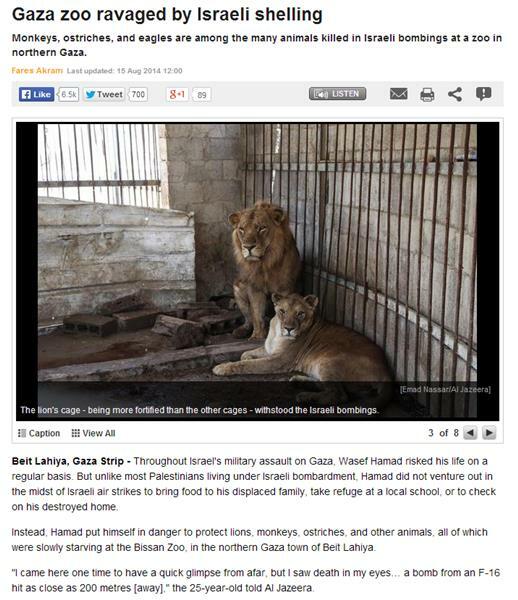 The views represented by Brand do not necessarily reflect those of Al Jazeera. Looks like an unexploded Israeli missile just blown up somewhere near Arkmed hotel - northwestern Gaza. 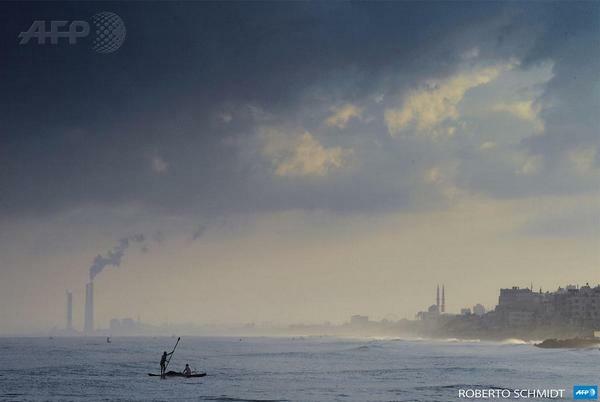 This picture by the AFP's Roberto Schmidt shows fishermen in Gaza taking advantage of the lull in fighting. The truce responsible for the relative calm is due to expire at 12:01AM local time. Palestinian negotiators are due to hold a press conference on the outcome of negotiations in Cairo to bring an end to the conflict in Gaza. We'll keep you updated as soon as it starts. 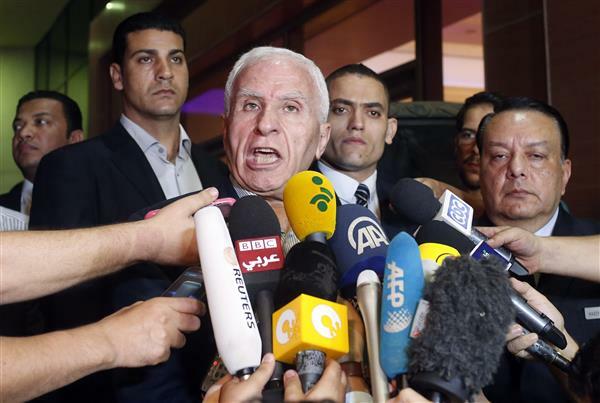 Israeli and Palestinian negotiators have agreed to extend a ceasefire in Gaza for another five days after failing to reach a long term agreement in Cairo-mediated talks, Palestinian and Egyptian officials said on Wednesday. 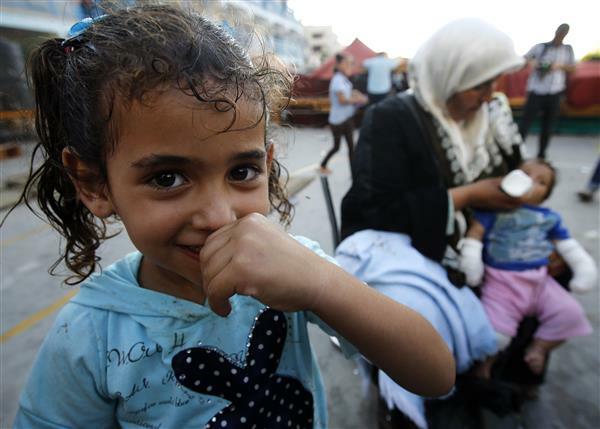 The fighting in Gaza has devastated the besieged territory's agricultural capability, with damage to crops, herds, fishing, and irrigation systems, bringing food production to a halt and sending porices rocketing. 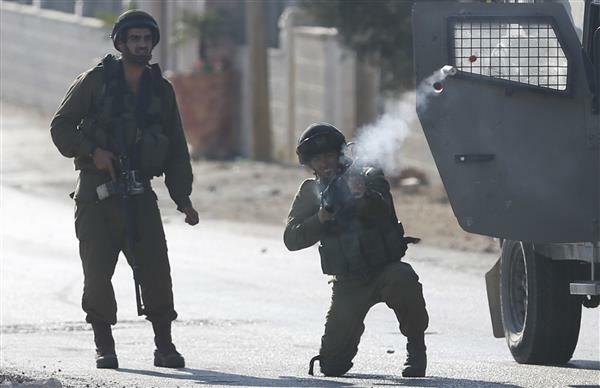 The Palestinian Interior Ministry in Gaza has accused Israel of a cross-border shooting in violation of a truce. 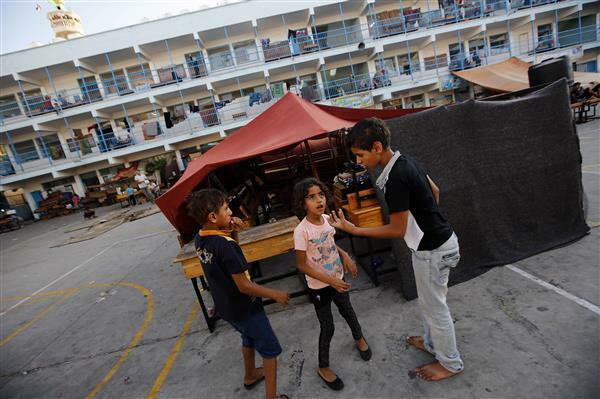 The ministry run by Hamas Islamists who dominate coastal Gaza said on Friday that Israeli troops shot at houses east of the town of Khan Younis, according to Reuters news agency. 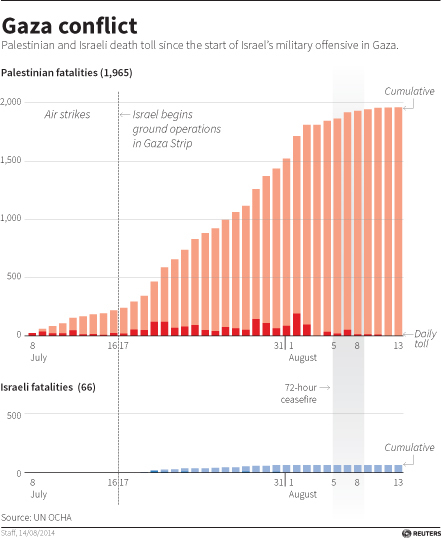 The death toll in the war-torn Gaza Strip rose above 2,000 on Monday, the health ministry said as more people injured in over a month of fighting with the Israelis succumbed to their wounds. According to a ministry statement, a total of 2,016 people were killed and another 10,196 wounded. Among the dead were 541 children, 250 women and 95 elderly men, it said. The toll, which had stood at 1,980, jumped up after a number of people died from their injuries in hospitals across Gaza, as well as in Cairo and Jerusalem where they had been taken for treatment. Medics also retrieved another body from under the rubble in the battered Shejaiya district east of Gaza City, where it had lain for more than three weeks, the statement said. Separately, the Israeli army confirmed that five of 64 soldiers killed in combat had died as a result of "friendly fire". Benjamin Netanyahu is meeting government officials over efforts for a permanent ceasefire in Gaza, as a temporary truce between the two sides neared its deadline. The gathering of the Israeli prime minister's advisers was planned to take place on Monday, hours before a five-day ceasefire with Hamas, the governing body of the Palestinian territory Gaza, comes to end at midnight (9pm GMT). Israeli and Palestinian leaders have agreed to extend a temporary ceasefire in Gaza by 24 hours as the search for a permanent deal continues, according to several reports. The AFP and Reuters news agency, and the Egyptian state news agency, said on Monday that the extension was agreed hours before a renewal deadline of 9pm GMT. In response to today's rocket fire, we have begun striking terror targets in the Gaza Strip. There are no talks if the ceasefire is violated. The Egyptian process has a clear sequence. A complete and absolute cessation of hostilities. If that first part is not held, there’s nothing to talk about. Hussam Badran, a Hamas spokesman in Doha, told Al Jazeera that the group could not confirm whether Hamas or any other factions fired rockets into Israel and that the next few hours would clarify the situation. Israeli response came in extremely quickly - it seemed like within fifteen minutes of those rocket attacks we could see their response. 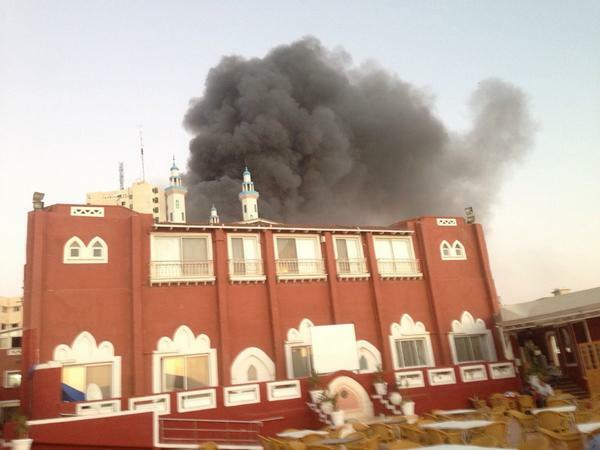 Most people around me have their eyes to the sky watching for the next air strikes. 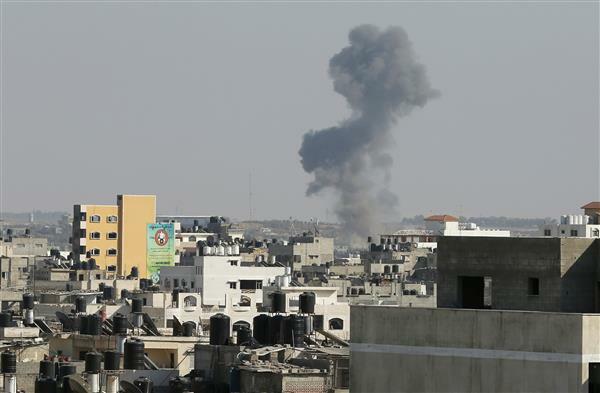 Gaza's health ministry reports that two children were injured in an Israeli attack targeting the airport area in Rafah. Here are first pictures of the attacks on Gaza. 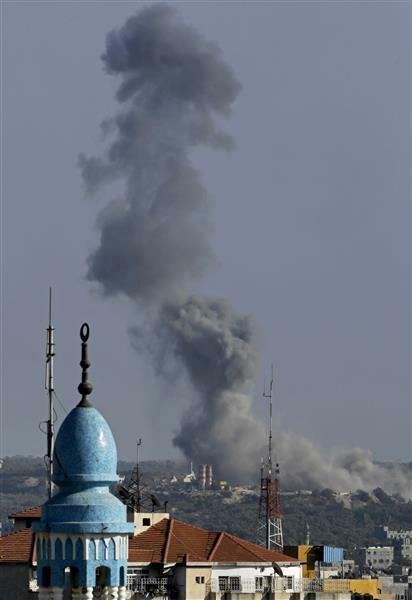 Al Jazeera sources say 10 air strikes in the Gaza Strip. 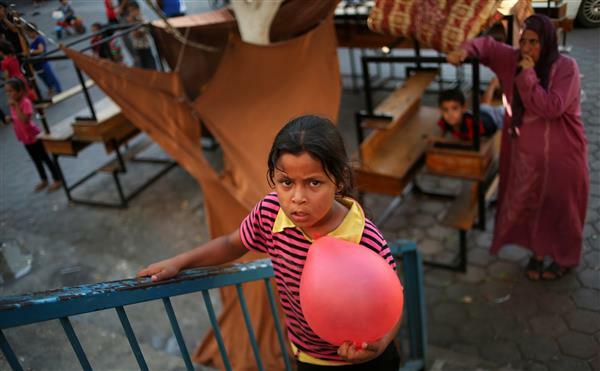 Our correspondent Hoda Hamid cites a UNRWA worker as saying thousands of people have fled their homes and arrived at the UN schools after the latest round of attacks. 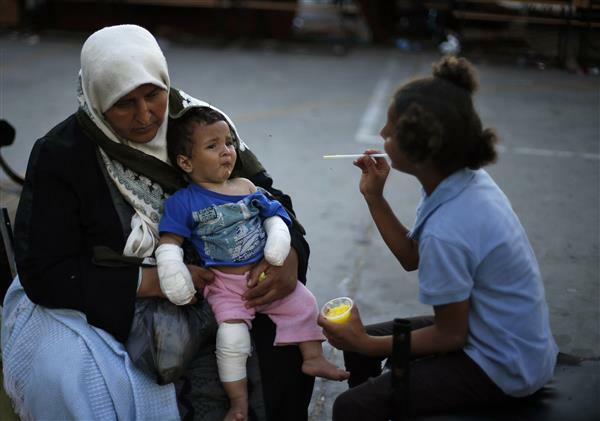 The health ministry in Gaza says that the total injured in attacks today has risen to eight.